Please join York Suburban Dollars for Scholars for the 2019 awards presentation and 20th anniversary reception! 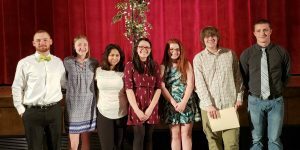 The awards program will be held on May 7, 2019 at 7:30 p.m. in the High School auditorium. The 20th anniversary reception will be in the High School cafeteria immediately following the awards program. To date York Suburban Dollars for Scholars has awarded 151 scholarships to 135 students totaling $440,500. The scholarships are often renewable so York Suburban graduates can be supported over their full college careers. Currently 76% of the scholarship recipients are multi-year awardees. More information about York Suburban Dollars for Scholars can be found at http://www.yorksuburban.dollarsforscholars.org. 2018 Awardees (L-R): Jake Taylor, Brooke Ruth, Athin Ishaq, Alana Hyunh, Claire Barley, Steven Burchett, and Aidan Fryar. Not pictured: Maya Lehman. 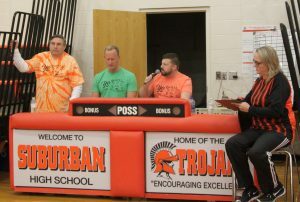 BOB 2019 kicked off by Dr. Tim Williams with Mr. Eric Hoffman and Mr .Jamie Evans keeping stats and time and the Honorable Jennifer Clancy keeping score.